Shakespeare's baptism record. The three "X"s were added later to highlight the entry. In the Stratford parish register, an entry for April 26, 1564, reads Gulielmus filius Johannes—"William son of John Shakespere." Baptisms in this period followed hard upon birth. Because of high infant mortality and anxiety about the fate of the unbaptized, the gap between birth and baptism was usually a matter of days, not weeks, so Shakespeare might well have been born on April 23. That's the birthday assigned by the eighteenth-century Stratford curate Joseph Greene and celebrated ever since. But we don't really know when Shakespeare was born. We can be almost certain that he died on April 23, 1616, the date given on the funeral monument in Stratford's Holy Trinity Church. The monument, by Gerard Johnson, was commissioned by Shakespeare's family, who would have known both his death day and what he looked like. This makes the monument's bust one of two representations we can be sure is of Shakespeare. The other is Martin Droueshout's engraving in the First Folio, the collected works put together by actors who had worked with Shakespeare; it included poetry by others who knew him, including his fellow playwright Ben Jonson, whose poem praises the engraving. Neither the engraving nor the bust is as accomplished as the Chandos portrait, which hangs in the National Portrait Gallery but which might not be of Shakespeare. The bust is particularly crude, having undergone several restorations. The first of these was arranged by Joseph Greene, whose many efforts at memorializing Stratford's most famous son brought him to the attention of London literati, including the Shakespeare scholar George Steevens. 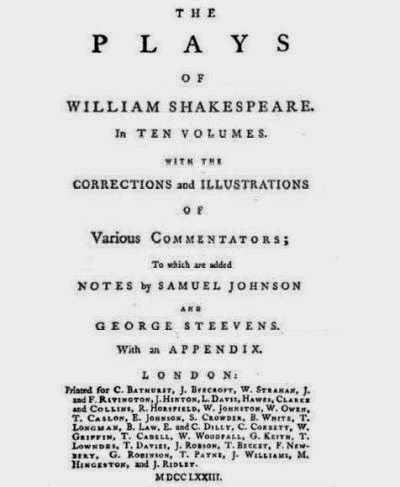 Greene gave Steevens the April 23 birthday, and Steevens published it in his and Samuel Johnson's popular 1773 edition of Shakespeare's plays (Corney 4). Greene had no evidence for his date and may have simply chosen it out of patriotism. April 23 is St. George's Day in England—it's on other days elsewhere—so choosing it made the birthday of the country's greatest writer coincide with the feast day of its patron saint. To paraphrase Shakespeare's Henry V at Harfleur (3.1.44), "Cry, 'God for England, William, and St. George!'" If Shakespeare was born on April 23, then he's in the same-birthday-death-day club that includes Ingrid Bergman, Machine Gun Kelly, and Caesar's assassin Cassius. This last fact was curious enough for Shakespeare to use it in Julius Caesar (5.1.71), but, before Greene, no ever mentioned that Shakespeare was born on the same day he died. If he had been, we might have expected someone to note it, which is why April 23 is an unlikely day for his birthday.